Don’t let the name the “bake shop” name make you think that they are just a bakery, Dozen Bake Shop has a selection of lunch items worth a stop at any of their Pittsburgh locations. On my recent stop on last Friday, I was very pleased with the lunch offerings. 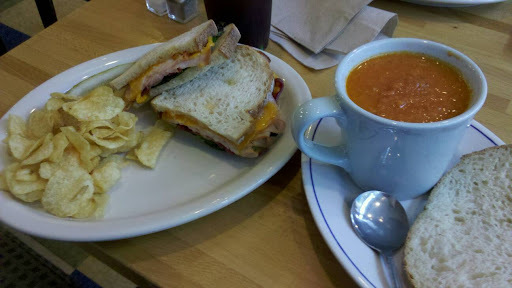 I selected a cup of Tomato Basil soup and a Turkey and Cheddar sandwich. The sandwich was available either heated or cold, I opted for it hot and very much liked the results. The sandwich was made with very nice bread toasted gently as a hot sandwich, enough to melt the cheese. In my opinion, the soup was just okay. You could tell that there were fresh herbs used in the construction of this slow simmered soup, which I am very much in favor of, however they were not chopped fine enough for me and I did not enjoy picking the stringy herbs from my teeth. Despite the soup, I always enjoy my trips to Dozen. I look forward to trying more of their non-bakery options and sharing them with everyone. Since … I can’t have a sweet tooth every time I go in.